Originally published in 1981 and updated in 2008, Back to Basics was one of the first modern-day books on how to develop skills like those possessed by our forefathers. The book features step-by-step instructions on how to complete hundreds of projects, many of which could be very helpful in the area of apocalypse survival. Part one gives you detailed information about planning and building a home using materials such as adobe, logs and stone. You can also learn about fireplace building as well as developing and sanitizing a water supply. Part two shows you how to harness various energy sources. It shows you how to harness the power of water, build and install windmills, and a number of other helpful projects. Part three covers how to grow or find plants, particularly in small spaces or with limited resources. It also has very basic information on animal husbandry. Part four includes information about preparing and preserving food. It offers plenty of recipes as well as advice on how to can, bake and dry your food. Part five gives you useful information on how to make crafts and learn skills to help in a survival situation. You can learn how to weave, quilt and make rugs and ropes as well as how to make brooms, soaps and candles. The book also has information on working with leather, metal and wood. This book offers clear, concise and easy to understand steps to complete hundreds of projects. The book offers full color charts, illustrations and photographs to make things easier for readers to understand. Throughout the course of the book, you can learn such varied and useful skills as how to raise chickens and how to make various foods such as blueberry jam or cheese. You can also learn how to make a hutch table using only hand tools and how to dye your own wool. If you really want to get ambitious, the book even includes instructions on how to build your own living space such as a log cabin or adobe brick homestead. 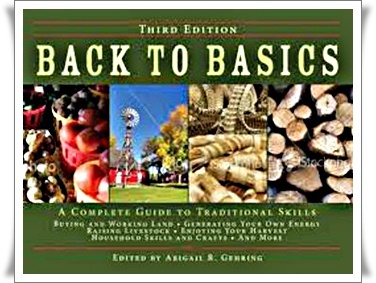 The Back to Basics book was compiled by approximately 40 members of the Reader’s Digest staff and was edited by Abigail Gehring. Gehring also edited a book called Odd Jobs and Dangerous jobs and grew up learning from her family how to do the projects in this book. Many readers and reviewers enjoy the clear step-by-step instructions and the detailed color pictures and diagrams. They see Back to Basics as an excellent reference book to have in your library. However, some reviewers mention that the information is a bit too general, yet it does cover many different and useful topics. The aim of the book seems to be to help people more with homesteading than survival, but most reviewers do recommend reading it and believe that it is a good addition to any library. Back to Basics offers plenty of projects that are both fun and educational and provides clear, detailed instructions. While the book is not specifically about apocalypse survival, it contains information that is interesting and could come in very handy.